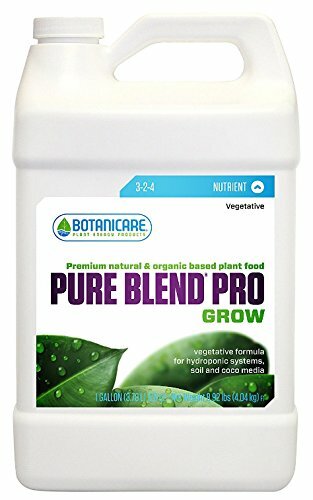 Pure blend pro gro is a hydro-organic vegetative and fruit and flower formula which is a specialty custom blend of organic and natural sources of the essential major, secondary, and trace minerals in 100 percent soluble form from the land and sea. Produce vigorous lush green vegetation and superior fruits, flowers, and vegetables. When compared to conventional chemical fertilizers, pure blend pro will provide increased nutritional values and is a healthy alternative. This product weighs 54.5-pound. Available in 5-gallon. Measures 11-inch length by 10-1/5-inch width by 13-2/3-inch height. 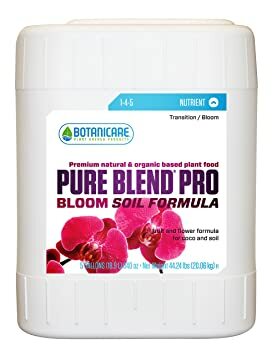 Pure Blend Pro Soil 1-4-5 blooming natural and organic-based nutrient is specifically designed for plants cultivated in soil and coco. Containing only natural sources of essential major, secondary and trace minerals from the land and sea in a 100 soluble form Pure Blend Pro Soil encourages the development of vigorous buds, fruits and flowers. Cultivating plants in soil requires higher phosphorous levels to offset clay colloidal particles that bind up phosphorous and offset soil microbes that also compete for the phosphorous. 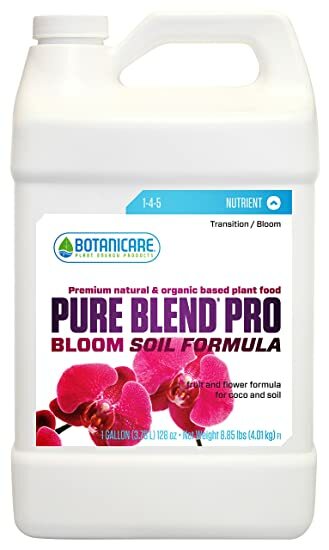 Pure Blend Pro Soil 1-4-5 offers this needed phosphorus and provides nutritional value for blooming fruiting and flowering plants. Pure blend pro soil is a hydro-organic fruit and flower soil formula. Formulated for plants cultivated in soil and for the final ripening of fruit in the last stage of hydro-organic gardening. This product Weighs 49.9-pound. Contains 1 percent nitrogen, 4 percent phosphorus and 5 percent potassium. 1 Year warranty. Available in 5-gallon. 1 year warranty. Measures 10-inch length by 11-1/5-inch width by 13-2/3inch height. 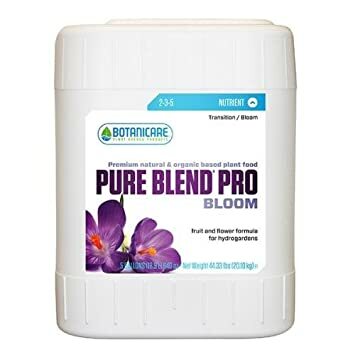 Pure Blend Pro Bloom 2-3-5 fruit and flower blooming base nutrient contains only natural sources of essential major, secondary, and trace minerals from the land and sea in a 100 soluble form.These ingredients encourage the development of vigorous buds, fruits, and flowers. 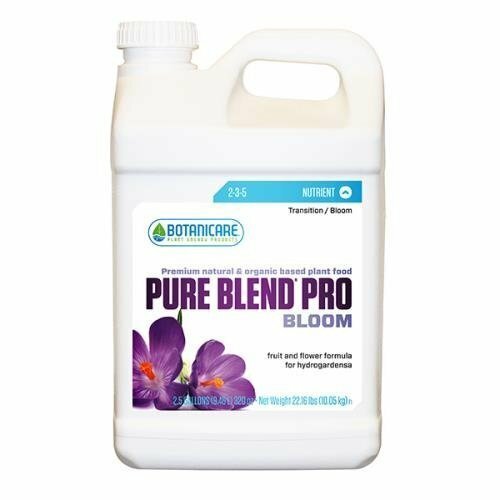 Providing increased nutritional value for blooming fruiting and flowering plants Pure Blend Pro Bloom is an environmentally friendly alternative to conventional chemical fertilizers. 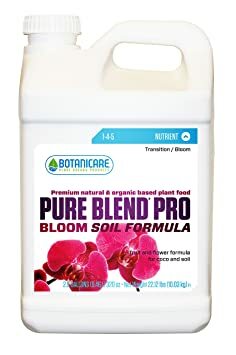 Pure blend pro soil is a hydro-organic fruit and flower soil formula. Formulated for plants cultivated in soil and for the final ripening of fruit in the last stage of hydro-organic gardening. This product Weighs 29.1-pound. Contains 1 percent nitrogen, 4 percent phosphorus and 5 percent potassium. 1 Year warranty. Available in 2.5-gallon. 1 year warranty. Measures 9-inch length by 7-inch width by 14-inch height. 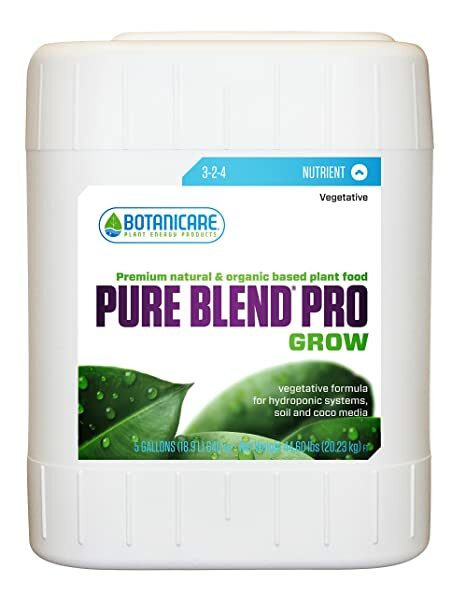 Pure blend pro gro is a hydro-organic vegetative and fruit and flower formula which is a specialty custom blend of organic and natural sources of the essential major, secondary, and trace minerals in 100 percent soluble form from the land and sea. Produce vigorous lush green vegetation and superior fruits, flowers, and vegetables. When compared to conventional chemical fertilizers, pure blend pro will provide increased nutritional values and is a healthy alternative. This product weighs 24.9-pound. Available in 2.5-gallon. Measures 9-2/5-inch length by 6-5/7-inch width by 14-inch height. 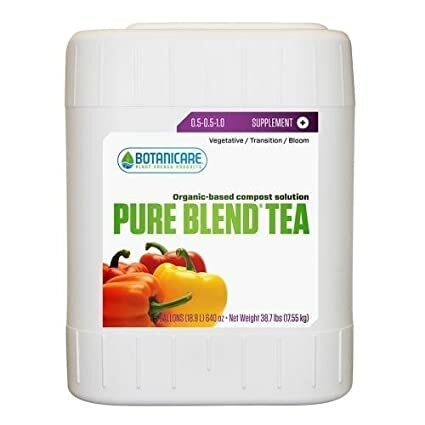 Pure Blend Tea is a soluble compost tea solution that is easily absorbed by plants grown in hydroponic, soil and soilless mediums. Select ingredients are brewed with beneficial humic acids to release each element’s unique attributes into this versatile blend. 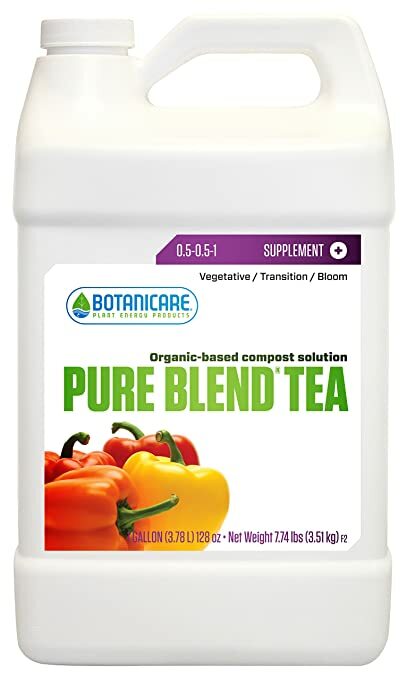 Pure Blend Tea, Botanicare’s original flavor and aroma-enhancing supplement, is now better than ever. The Original Pure Blend Grow and Bloom formulas have been combined to create one highly effective formula. This single bottle formula, once again, sets the industry standard; using premium organic elements derived from all natural sources. Pure Blend Tea contains all major and secondary components essential for maximizing flavors and aromas. This new formula is fortified with select trace minerals, naturally occurring growth hormones, cytokines and plant auxins. In addition, Pure Blend Tea is augmented with a complete array of vitamins, enzymes, amino acids, ultra soluble humates, fulvic acid and carbohydrates. Pure Blend Tea’s unique, proprietary formula guarantees that your garden contains the critical elements needed to harvest the most flavorful and aromatic fruits and flowers every round. 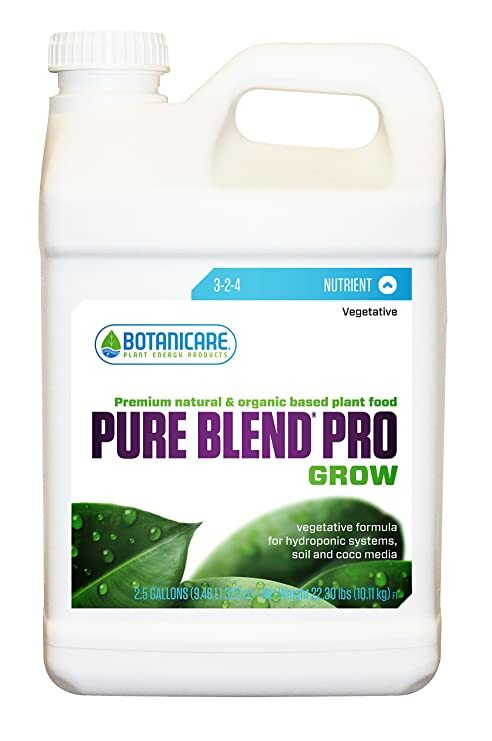 Pure Blend Pro Grow 3-2-4 contains only natural sources of essential major, secondary, and trace minerals from the land and sea that promote vigorous, lush green vegetation in a 100 soluble form. Providing increased nutritional value for developing fruiting, flowering and vegetable plants, Pure Blend Pro Grow is an environmentally friendly alternative to conventional chemical fertilizers. Pure Blend Tea combines the key elements of both Pure Blend Original Grow and Bloom into one highly effective formula. 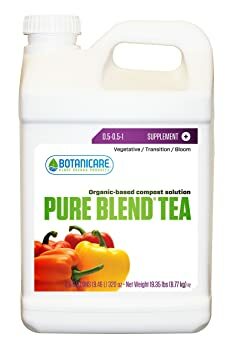 Pure Blend Tea is enhanced and fortified with a premium blend of ultra-soluble humates, organic plant acids, trace minerals, vitamins, and select amino acids. Pure Blend Tea redefines what a complete organic plant booster can be. 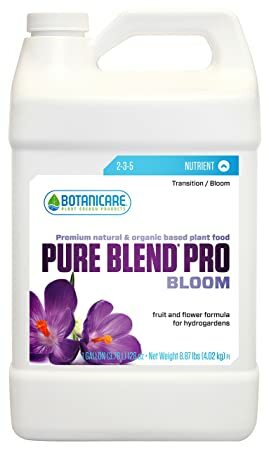 Pure blend pro bloom is a hydro-organic vegetative, fruit, and flower formula. It features a special blend of organic and natural sources in 100 percent soluble form from the land and sea. Produces vigorous lush green vegetation and superior fruits, flowers, and vegetables. Implementing pure blend pro into your indoor garden is a healthy alternative to more chemically-based brands. This product weighs 29.1-pound. Available in 2.5-gallon. Measures 9-inch length by 7-inch width by 14-inch height.